Home » Science/Tech » Pinterest Announces Unlimited Secret Boards! 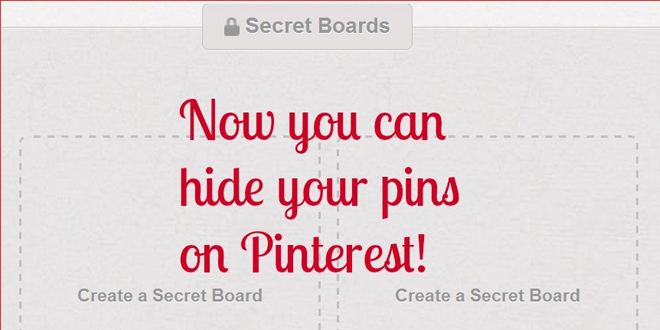 Pinterest Announces Unlimited Secret Boards! One of our favorite Pinterest features was the ‘secret board’ that allowed us to keep a private collection that we are not yet ready to share with our friends. Pinterest too has understood that there is no point in limiting users with the number of secret boards, they have just announced that now users can create unlimited secret boards. During the holidays, we gave everyone a few more secret boards so people had a place to plan their gift lists and holiday surprises. Since then, we’ve heard all sorts of interesting ways Pinners are using secret boards, so we’ve decided to give you as many as you’d like! Secret boards are perfect for planning something you’re not quite ready to reveal to the world—inspiration for that website you’re building for your business, perhaps? Maybe you have personal goals you want to keep, well, personal. Try a secret board—no one will know about your fitness plan for bulking up or leaning down before your upcoming vacation. Don’t forget, you can always invite friends to your secret boards so you can hatch plots together in private. With unlimited secret boards, there’s no limit to the number of ways for you to plan, contemplate, practice and explore all the things you want to do. Go ahead, keep it a secret. We won’t tell. Apple iPad 3 Launch Event Set on March 7! What Happens When You Cry in Space? Catherine Zeta-Jones & Michael Douglas Spotted Together! Ron Paul Sold-out in Pittsburgh Town Hall! Electric Cars are 'gay' ?! ?